Citroen has unveiled the DS4 Racing at the Geneva Motor Show. A high performance concept much like the DS3 Racing, rumours are that the DS4 Racing will go into production with a limited run of models available at the end of 2012 and costing somewhere in the region of £30,000. 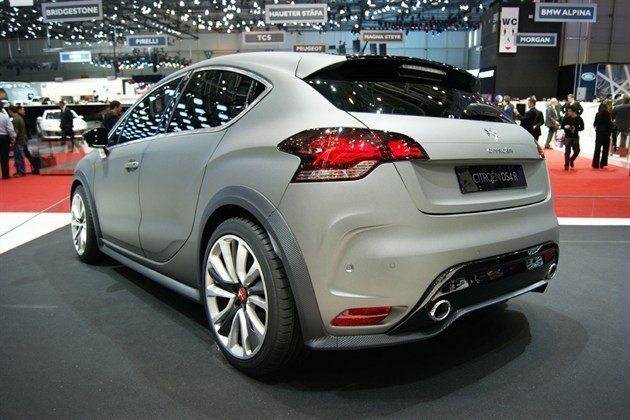 Powered by the 1.6-litre THP petrol engine, the DS4 Racing produces 256bhp with CO2 emissions of 155g/km. The chassis has been modified and the Racing is 35mm lower than the standard DS4 plus it has a wider track, larger wheels and more powerful brakes. The show car is finished in striking matt grey paintwork with carbon fibre details like the diffuser, splitter and wheel arch extensions. It also gets two tone 19-inch alloy wheels with a red centre.